Suicide Prevention Week in Missoula is set for September 9 -15, 2017. This is our community's way of recognizing World Suicide Prevention Day, September 10, and National Suicide Prevention Week. A week of free events and activities are scheduled with the theme "Your Tomorrow Matters." 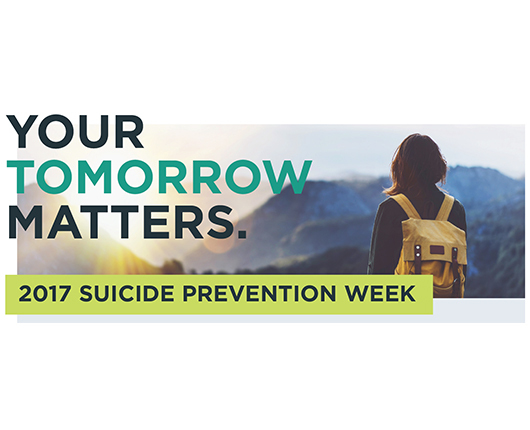 Suicide Prevention Week is sponsored by the Institute of Health and Humanities, United Way of Missoula County, Missoula City-County Health Department, and Tamarack Grief Resource Center. Don’t miss the IHH-sponsored documentary Crisis Hotline: Veterans Press 1 to be shown on Wednesday, September 13th at 7 pm at the Roxy Theater. Free and open to the public. For more information about Suicide Prevention Week, please visit the Project Tomorrow website. Join Missoula Mayor John Engen and KECI/NBC Montana news anchor Heidi Meili as they speak about the importance of suicide prevention in Missoula County and walk to raise awareness of suicide prevention. Visit the Out of Darkness Walk Missoula website. Sometimes words fall short, yet trauma impacts our bodies. Let’s walk about it! Join us for a casual stroll along the Clark Fork River. No registration necessary. Free and open to anyone grieving the death of a loved one. Youth must be signed in by a guardian, and children under 12 must be accompanied by an adult. Wear your walking shoes! Missoula Mayor John Engen will read the 2017 Suicide Prevention Week Proclamation during Missoula City Council’s weekly meeting as part of City Council’s support of suicide prevention. Applied Suicide Intervention Skills Training (ASIST) is a two-day interactive workshop in suicide first aid. ASIST teaches participants to recognize when someone may have thoughts of suicide and work with them to create a plan that will support their immediate safety. Email nancy.berg@mso.umt.edu to learn more and register for this two-day training. Training continues 8:30 a.m.-5 p.m. on Sept. 13. $140 fee. The tension or edginess that can be present following trauma increases suffering. Take time to learn a few strategies to help bring moments of calm and breath into trying times. A powerful autobiographical play about childhood trauma and resilience in a Native American community, followed by panel & audience discussion. Free, and open to the public, one-hour presentation on suicide prevention by Missoula psychiatrist, Dr. Blair Davison. Free, and open to the public dance workshop.